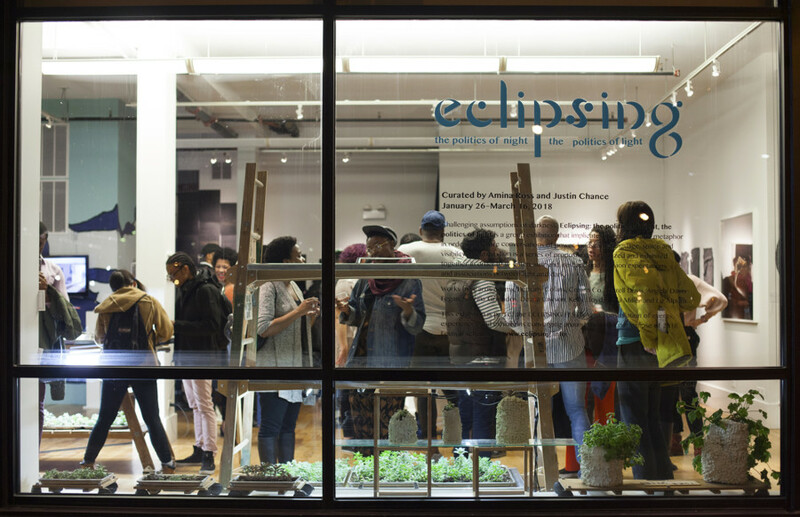 Celebrate the release of the Eclipsing exhibition catalogue with selected readings by Jared Brown and Alia Walston. The festivities continue with DJ Hijo Pródigo and performance by Petty Crocker. Alejandro T. Acierto is an artist and musician whose work is largely informed by the breath, the voice, and the processes that enable them. He is an Artist in Residence in Critical Race Studies at Michigan State University, a 3Arts awardee, and has shown his work internationally at the Film Society of the Lincoln Center, MCA Chicago, and the Art Institute of Chicago among others. A founding member of Ensemble Dal Niente, Acierto holds an MFA from University of Illinois at Chicago, an MM from Manhattan School of Music, and a BM from DePaul University. Jared Brown is an interdisciplinary artist born in Chicago. In recent work, Jared has been broadcasting audio and text based work through the radio (CENTRAL AIR RADIO, 88.5 FM), in live DJ sets, and on social media. They consider themselves a data thief, understanding this role from John Akomfrah’s description of the data thief as a figure that does not belong to the past or present. As a data thief, Jared Brown makes archeological digs for fragments of black American subculture, history and technology. Jared repurposes these fragments in audio, text, and video to investigate the relationship between history and digital, immaterial space. Jared Brown is interested in exposing complexities within black American subculture. They consider these gaps and slippages as a type of code that holds the key to a personal and collective future. Jared Brown holds a BFA in video from the Maryland Institute College of Art. Daughter of Chicago and High Priestess of the stars, Alia Ra’naa Walston dedicates her tarot practice to filling gaps in our self-knowledge with advice on healthful living. As a tarot reader and astrologer, she focuses on providing advice on developing practical healthy habits through encouraging a deep examination of the soul and the symbolic cycles of life, death, and rebirth. She’s the ideal guide for the journey the Fool in each of us makes. As an art administrator, her career in the arts began during her studies in Art History at Oberlin College. She is currently the External Partnerships and Programs Manager at The Chicago High School for the Arts, working as the liaison between the school and arts partners throughout the city. is the sound identity of the Philadelphia born/Chicago based DJ, Justin Ignatius Mitchell. Influenced by dance music at an early age, Mitchell’s sound reflects the diasporic sounds found in communities of color across the world. Their work also serves to contribute to a sonic and physical dialogue regarding queer spirituality, the folly of masculinity, and the nihilism of nightlife. Hijo Pròdigo is currently working on new ways of existing and has found a platform to access their potential in the Chicago born FUTUREHOOD music label/ artist collective.